Below you’ll find the canonical reference for New Year email planning. From email examples to specific promotional strategies, we’ve included everything you need to ace your campaign. This brand, a DIY video community, is all about helping its members live life better, and this email, sent the day after Christmas, holds up that brand promise. It speaks to both the party-goer and the party-giver with easy-to-access videos, a clean, uncluttered design and a colorway easily distinguished from the classic red-green-gold of Christmas. Caution: "New Year New You" is a subject line that comes dangerously close to cliché. But this take on that popular expression is totally brand-appropriate. Especially this time of year when many recipients are stuck in the cold and snow and longing for a change of scenery. We love how forward-looking this email is, and the sparkly gold animation doesn't hurt, either. Wouldn't you love to get an email like this? It's fresh, bright and cheerful. 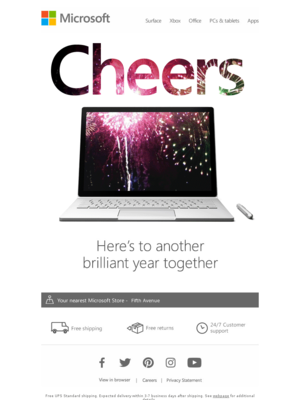 We see a lot of fireworks animations in New Year emails, but this is a great subtle promotion of MS products. It's a nice step back from the brand's constant promotion in the preceding month. 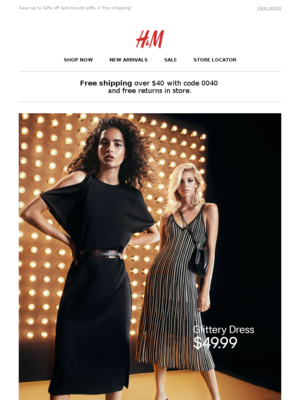 Interesting timing on this email: H&M sent it on Dec. 19, just as the last-minute Christmas crush is hitting its peak for many emailers. The preheader and content at the bottom of the message are nods toward Christmas shopping. But the hero image, black/bronze/gold colorway and message copy clearly promote slinky party looks aimed right at the recipient. Follow-up emails reverted to the Christmas theme. We picked this email because it covers all of its customer bases: the party people and the people for whom big noisy bashes are one of Dante's circles of hell. It can be tricky to pull off an email with a split personality like this. But M&S makes it work because it offers stay-at-homes not just a curated product collection but also a feature to read as you curl up in your comfy clothes. While your customers are rebooting their lives on New Year's Day, why not clue them in on what's happening in your company? This email uses its New Year's greeting to restate its value proposition for its customers. 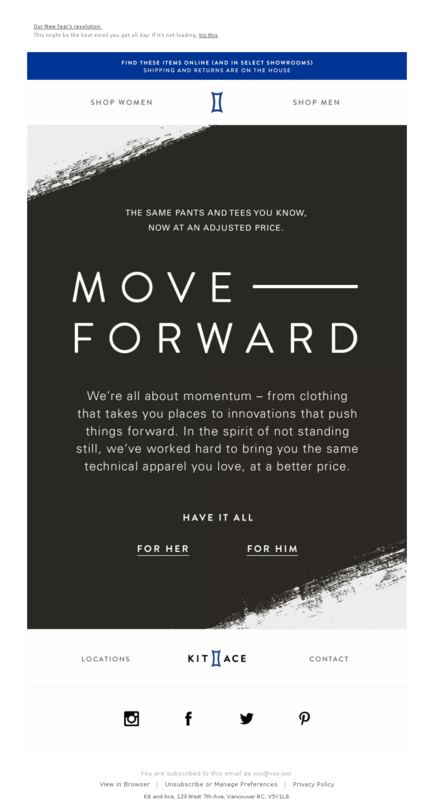 It departs from its standard template of pretty people in attractive clothing with a no-frills, black-and-white format that focused on the value message: same great merch, new lower prices. 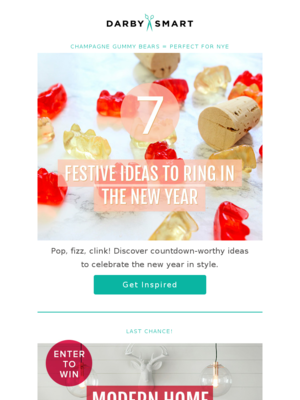 Start planning your New Year email strategy with great examples. This FragranceNet email calendar is based on FragranceNet.com, who sent 1 emails for New Year in 2018. This Carbon38 email calendar is based on Carbon38, who sent 1 emails for New Year in 2018. This IGIGI email calendar is based on IGIGI, who sent 0 emails for New Year in 2018. Will you simply send one email on New Year or will you send a few emails leading up to it, including a “last chance” email once the event is over? Based on 6530 emails mentioning "confetti", "resolutions", "happy new year", "new year" in the subject line. Discover the most popular types of promotions used for New Year. Understand how steep a discount companies offer for New Year. You can toggle between Dollars Off and Percent Off. 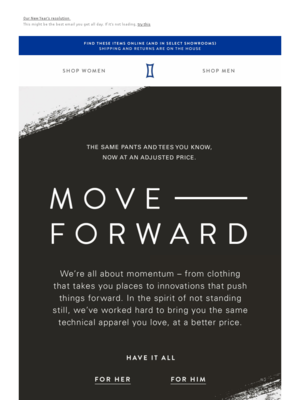 Ace your New Year email content with these ready-to-implement strategies. Enjoy! The challenge for retailers: attracting shoppers who are bruised and battered from an avalanche of last-minute, last-ditch, desperation-tinged emails, post-Christmas sales and closeouts and real-world distractions like travel, parties and down time, not to mention depleted wallets and exhausted credit cards. But consumers also ready to spend the gift cash and cards that showed up in their stockings or appeared via internet magic. Anything that promises a fresh start and a change of pace from the year that just concluded will be appealing, too. 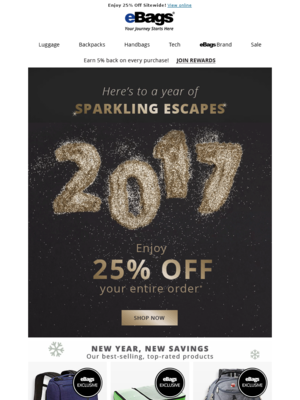 Retailers need to freshen up their email templates for New Year’s promotions – not so crazy-different from their standard messaging templates that customers won’t recognize them or connect them to your email program at large, but something that looks different from the color and copy choices that drove their pre-Christmas campaigns. New Year’s Eve is all about parties and saying goodbye to the old year (maybe even “good riddance!”). New Year’s Day is devoted to fresh starts, resolutions and change. Messages that appeal to those general influences will strike responsive chords with your shoppers. 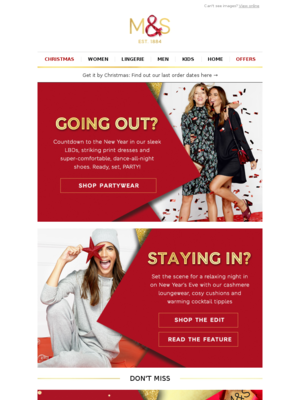 Many retailers start their New Year’s messaging while their Christmas campaigns are in full swing. Strategically, it makes sense to give your shoppers a break from a steady drumbeat of holiday emails with a fresh message. Plus, you’ll help your customers who are already planning for NYE. Strategy 1. Play up the party. For many shoppers, New Year’s Eve is all about getting together with friends and family, whether dressing up and going out or gathering people together to party on the premises. If those activities fall within your marketing plan, your mission is clear: help them have a blast, whether it’s looking better than anybody else at the party or throwing a memorable bash at home. Emails that wrap helpful content around promotions give your readers more reasons to read instead of swiping past them. Buying guides that showcase collections, how-tos for makeup, party planning, putting together playlists and the like offer relevant content. Major holidays, from Easter to Veterans Day to Thanksgiving and all the way through to the end of year give you an opportunity to send greetings to your customers. The end of the year is a perfect time to thank your customers for their patronage, however the express it, through shopping, renewing memberships or using your services. A thank-you email is an excellent “white space” email – a message that gives your customers a little break from promotions but gives you a fresh, relevant reason to be in your customers’ inboxes. Hangovers aside, New Year’s Day is the day to start over. Fuel that optimism with content that looks forward to the coming year. (See the next section on introducing new products.) Use bright colorways that fit with your brand and cheerful copy that encourages customers to think positive. You don’t have to lay out your entire plan for the year, but your customers are probably ready to look ahead. Offer collections or sneak peeks of products and services that you have in the pipeline, even if you’re not ready to raise the curtain all the way. Check with your finance people to see what the most popular gift-card amounts were this past holiday season. Then, put together a product assortment that reflects those popular amounts, with a few higher- and lower-end products to round out the mix. Include instructions on how to redeem, whether in person or in-store. Add a price incentive to encourage more shopping.